“But really dude, does it have a reason for being?” I’m sure is what he would ask. If he was being polite. Rhetorically of course. Anyway, it was first published in Private Edition magazine circa 2011/12. Aimed at a much broader (largely non-fishing) audience, to be sure. To fly fish you need a rod and a reel and a tiny little hook covered in fur. And yes, you’re going to need to learn to cast. But what it is, what fly fishing really is, is: anticipation, surprise, joy and loss. To radically paraphrase Norman Maclean out of ‘A River Runs Through It’ – watching someone else cast a fly rod is the ultimate guessing game: What fly has he or she on? Where are the fish? Does the fisher even know? How well are they going to present the fly? How will the fish react? Would I have caught that fish had the rod been in my hand? That’s it then, you aren’t making assumptions, really you’re judging. You’d rather be on the water yourself, in touch with these primitive emotions. ANTICIPATION The business of ‘what if’s’ and imaginings begin long before you get anywhere near the water – at your car as you rig up your rod, knot the leader and tippet, tie-on the fly. If you tie your own flies it starts even earlier – over the vice as your thread-and-feather creations take shape. It’s not to be confused with patience though, this anticipation. Find a fly fisherman who claims patience and you’d be talking to a liar. If he did truly possess the virtue, he’d chuck a bait and sit idle on the bank waiting for a fish to come to him. 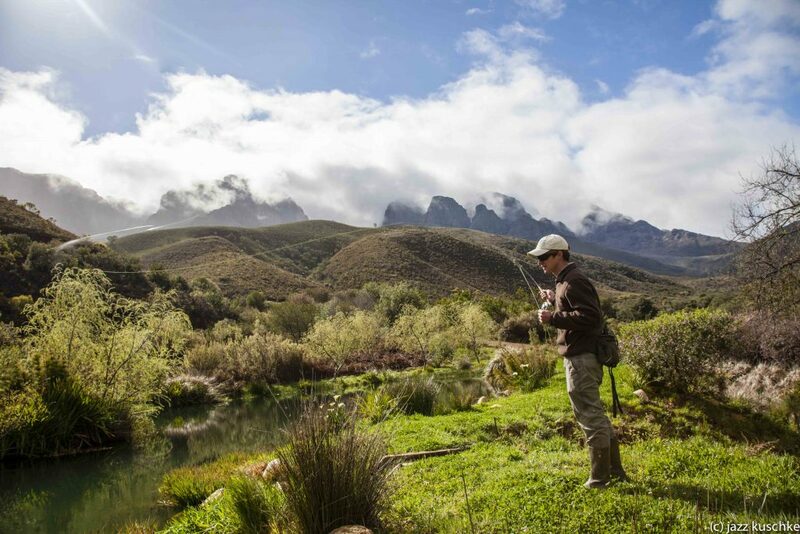 Fly fishing, by definition, is a thing of action – from stalking the quarry, to the graceful roll of line through the air and the drift and retrieval of the fly – it’s an expectancy and prediction that something is going to happen. And yet, when it does you’re always startled. Even if you knew (and sometimes you do) that that trout was going to take your fly. But it’s the chance that something absolutely astounding might just happen, that lures most back to the water: Finding a fish in a river run you always thought devoid, fooling a fish on a fly you designed and then tied yourself. Or, like the guy in picture, Al Saville, fighting a trophy-sized rainbow hen on a small river rod, from an unlikely lie on a stillwater he’s never fished. “That was insane! Such a hard hit, like hooking onto a log,” enough said. Ah, and they do ‘get away’. 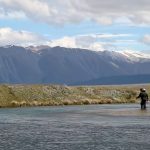 A lot… Having a trout you’ve sighted, stalked without spooking and then cast a dry fly at, rise to your offering only to refuse it; is like being told you’ve been upgraded to business class at check-in, enjoying all the lounge comforts until you board only to then be unceremoniously ushered back to cattle class. Fighting a wild-bred fish on a remote mountain stream for hour-long minutes only to lose it in the shallows, is worse. By some margin. River lore, educated guess, stream craft, gamble, pure skill or blind luck – your appreciation level of the fish in your hand may differ depending on which one it was that time. But the raw joy of having caught a fish with a rod and a reel and a tiny little hook covered in fur is euphoria every time. As you release that fish, you realise you’ll be waving the wand for the rest of your life. Ever trying to recreate that magic.